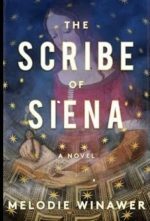 The Forum @ St. Ann’s presents author Melodie Winawer talking about her new book The Scribe of Siena with medieval scholar Neslihan Şenocak. Winawer transports readers to medieval Italy, where the past and present collide and a twenty-first century women discovers love—and a plot to destroy Siena. Winawer and Şenocak will discuss life in the medieval city of Siena, the real life plague that ravaged the city, and the mystery as to why Siena fared so poorly while other Italian cities did not. Melodie Winawer is a physician-scientist and an Associate Professor of Neurology at Columbia University. She has published 47 non-fiction articles and chapters. This is her first novel. Neslihan Şenocak is a historian and professor at Columbia University. Her work examines medieval religious orders and the daily life of 13th century Italy. Her most recent project is on the relationship of violent crimes and urbanization in 13th century Perugia. Please mark you calendar to attend this engaging discussion.